It was make or break in CONCACAF, time to grab the group by the throat in UEFA and the beginning of the campaign’s second half in CONMEBOL. Here are three of the big results from the last round of qualifying. It should never have come to this: a last group stage home game against Guatemala in which a loss could have put the US out of World Cup qualification. Regardless, the Yanks got the win they needed, despite a rocky start. The shaky American defense was again exposed just five minutes into the game, when Carlos Ruiz easily slipped US captain Carlos Bocanegra before poking the ball past a flailing Tim Howard and passing the ball home. Lucky for the home side, Clint Dempsey was ready to take the team on his shoulders. Dempsey took six of the Americans’ 14 total shots on the night, with two of their seven shots on target coming from his two goals. As if it weren’t enough to grab the 18th minute game-winner, the Texan also assisted Bocanegra on the equalizer minutes earlier. The US dominated every stat except, unsurprisingly for the opposition, fouls, and held a devastating 80% of the ball. But there are concerns about an American defense that allowed eight shots from a sub-par Guatemalan side and has been far from convincing in the last few games. 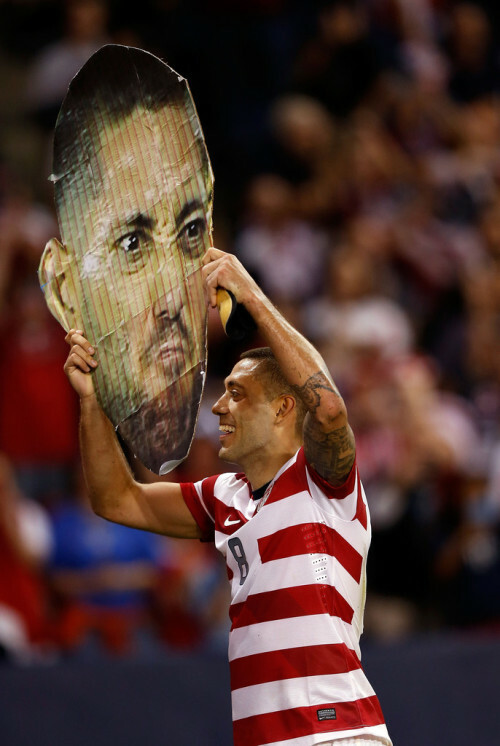 Clint Dempsey (and his giant replica Deuce Face) won’t always be able to save the day come the Hex. The few remaining Lionel Messi skeptics have long pointed to the Argentinian’s lack of production for his national team as an indication that he’s simply a good player surrounded by a superb cast at Barcelona. That lone blemish on Messi’s playing career looks to be disappearing. The Little Magician notched the first goal in a 2-1 road win against Chile on Tuesday, closing this year’s qualifying schedule with seven goals and two assists in nine games. Those goals have him tied with teammate Gonzalo Higuain for top scorer in qualifying and hot on the tail of Diego Maradona’s total for Argentina. Tuesday’s game was a difficult test, in which Chile put the visitors under intense pressure with five shots in the first 17 minutes. At a time when his side were dangerously close to falling behind in hostile territory, Messi stepped up to cooly give his team the lead. And with the win, they now sit comfortably atop their challengers, much like the little man himself. A 4-0 lead, less than half an hour left to play and Germany sitting comfortably on home turf. No doubt some fans thought they were better off heading out and finding something else to do with their time. The Swedes, though, didn’t get the memo. A four goal outburst in the last 30 minutes of the game saw Sweden roar back to a near impossible draw and keep themselves safely (for now) in second place in their qualifying group. Germany, on the other hand, passed up an opportunity to move out of Swedish striking distance, aside from discovering that their lineups aren’t the only leak they need to fix. The Germans only lost one major battle, surrendering 63% of aerial duels to the Swedes which will be a worry to a team traditionally dominant in the air. Even so, only one of Sweden’s goals came from a header. The home side took 62% of possession and took 18 shots to Sweden’s 11. With so much in their favor, allowing the opposition to score four goals from their only four shots on target all night is unacceptable. Die Mannschaft may well feel die wrath of Jogi Low. What teams impressed you in the last qualifiers of 2012? Who was disappointing? Let us know in the comments.